Madhurika Patkar is an Indian Table Tennis player who was part of the Women's team who won the Gold Medal in the Commonwealth Games 2018. 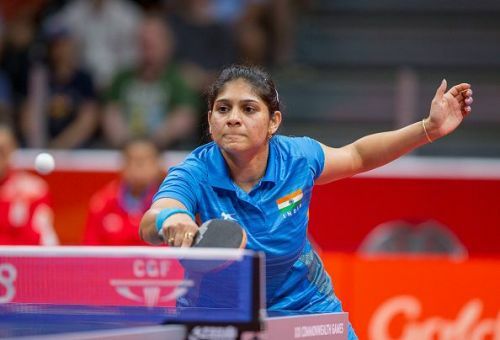 She started playing Table Tennis at the age of 7 and now is making her nation proud in several occasions. In an exclusive interview with Sportskeeda, Patkar talks about her success in CWG 2018 and her plans for the future. You were a member of the Women's Team who won the Gold Medal in the 2018 Commonwealth Games. What was the feeling when you were at top of the podium? Patkar: Winning Gold medal for India is always special and when it is at the Commonwealth Games then it is even more special. When I was on the podium receiving the medal, I was very happy and I couldn't stop smiling but as soon as our national anthem started and our Tricolor flag was slowly rising, I had tears in my eyes. They were tears of happiness and tears of satisfaction. In a flash all the hard work, all the sacrifices we did for the past two years as a team came in front of me. It was a magical moment for me. Even now I get goosebumps whenever I recollect that day. What prompted you to choose Table Tennis as your career? Patkar: I started playing Table Tennis at the age of 7. My dad wanted me to represent India and get medals for our country. When I was in 10th standard, I was India Number 1 in Sub-junior category. I had joined coaching classes because my club mates had come in merit in previous years and even I wanted to come in merit. I was always competitive. But then my father and my coach, Mrs . Shailaja Gohad told me that I am Number 1 and not everyone gets a chance to play for their country. I am someone special and unique. That time I realized that Table Tennis is what I will be pursuing. Table Tennis is my career and now I cannot imagine my life without Table Tennis. Sharath Kamal has been one of your idols. What is the best thing you've liked about him during practice sessions? Patkar: Yes, I idolize Sharath Bhaiya. He was the first one to break into Top 100 then into Top 50 and has been consistently performing at that level for so many years. In-spite of achieving so much, he is so down to earth. Sharath Bhaiya always guides everyone and in the real sense, he is the captain of the team. You were associated with Maharashtra United in Ultimate Table Tennis. What has been your experience out there? Patkar: Ultimate Table Tennis was a great experience for me. We were just like a family. We had bonded well. I always gave importance to physical fitness but when I was out for tournament there was a gap in my fitness sessions. But from them, I learnt how to continue with the fitness sessions even during tournaments. The way they practice and the way they think is really mesmerizing. It was really a great learning experience and it will be useful in my future tournaments. Which particular match/tournament would you like to call as the turning point of your career? Patkar: It was winning the Silver medal in China in the year 2001. It was my first international medal and the feeling I had after winning a medal not only for myself but for my country was also special. From there, I wanted more and more medals. We've reached halfway through the season. What are your plans for the rest of the season? Patkar: For us, the season is always on. International season is around the year. After June, the domestic season starts. Every day, I focus on improving irrespective of any tournament. Currently, my world ranking has gone down. I am working towards breaking into Top 100 again. We have Asian Games coming up. Winning a medal in Asiad will be special. There are various youngsters who aspire to win medals for the nation like you. What piece of advice would you like to give to these budding players? Patkar: I would like to tell them that winning a medal for our country and seeing our flag going up is the best feeling ever. But it needs a lot of sacrifices and a lot of hard work. You need to be strong physically and mentally because every sport ( TT especially now after the change in the ball) requires physical fitness and mental fitness. And most importantly, you should love the game; it should be your passion. Always focus on improving, success will come to you automatically.